I haven't eaten okra in a looonngg time, so I was pretty excited to cook this meal. However, when I realised that the other times I'd eaten okra was when my mum had cooked it for us, I stopped short and genuinely scratched my head for a few seconds as I stared down at the bright green batons. So if you've never cooked this "mind-boggling" vegetable before, I can assure you that it is wonderfully easy to make and incredibly tasty. My version eliminates the gooey texture by overpowering the okra with blended peppers and tomatoes. Eba is a dough made from garri (cassava flour) and a staple food eaten in the Southern parts of Nigeria. You can find it at any African food shop. Although it can be a little heavy (because of the stodgy consistency), paying attention to portion size goes a long way. Not only is it very high in dietary fibre, it also contains zero cholesterol and no saturated fat - win! To make the okra stew, place the chopped okra and vegetable stock in a saucepan and boil for 10 minutes. The consistency should turn gooey and bubbly. Blend the pepper, tomatoes and onion in a food processor and add to the pan of okra. Add the crushed garlic and season with salt. Cook for another 15 minutes on a low heat. To make the eba, place the garri in a large mixing bowl and add the boiling hot water slowly, mixing as you go along, until it forms a soft but firm dough - firm enough to hold its shape. 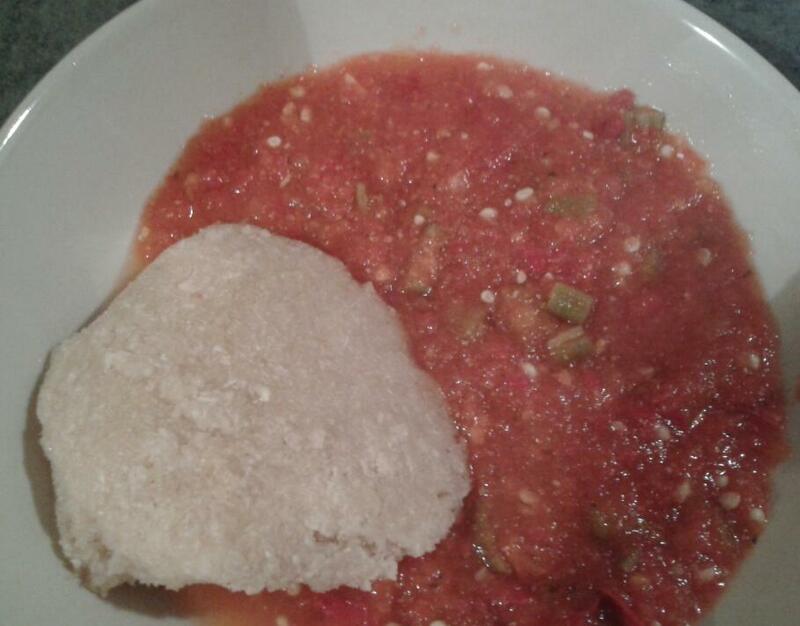 Use a wooden spoon to shape the eba into a round shape and serve with the okra stew. Nice one, its likely the okro will not draw by the time you add the peppers and salt though. This looks delicious, I can't wait to try it! I love that it's oil free, too. Will it work with frozen okra, or do I have to use fresh? Hi Lee! Yes, you can use frozen okra too. I hope you enjoy it!